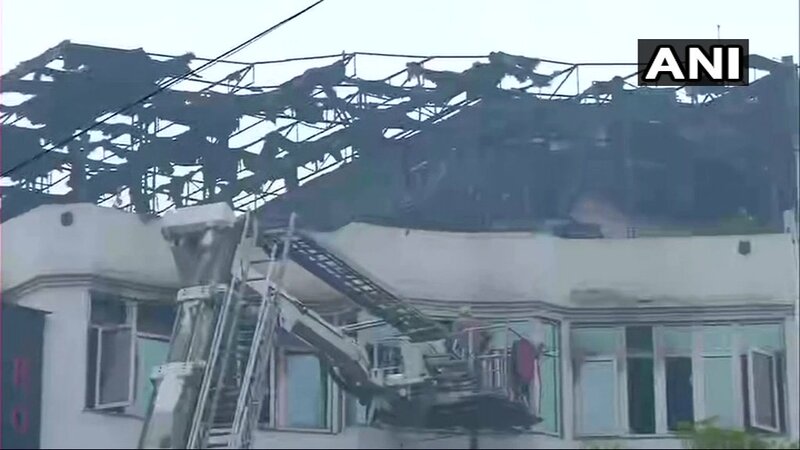 Karol Bagh Fire: More than two dozen fire engines were sent to the spot after the fire broke out at Hotel Arpit Palace around 4 am. Most people in the hotel were sleeping at the time. 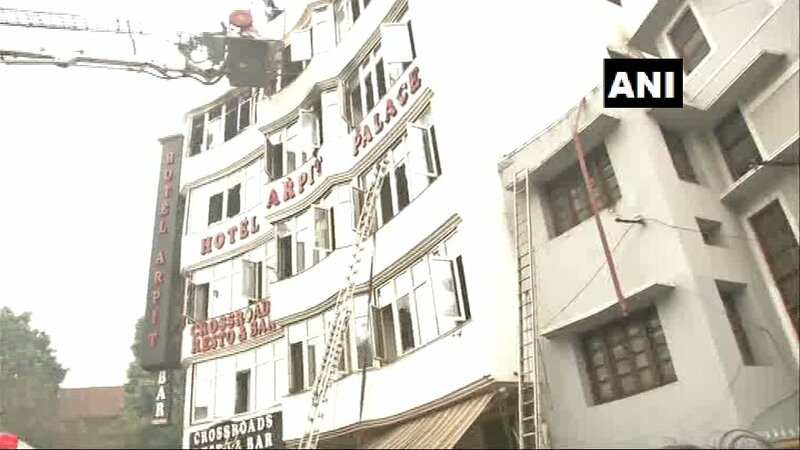 Hotel Arpit Palace Fire: At least 17 people died after a fire broke out in the Karol Bagh hotel today. At least 17 people were killed and three injured after a fire at a hotel in Delhi's congested Karol Bagh area early this morning. A woman and a child, among those dead, were killed when they tried jumping from a window after the Karol Bagh hotel fire, reports said. More than two dozen fire engines were sent to the spot after the fire broke out at Hotel Arpit Palace around 4 am. Most people in Hotel Arpit Palace were sleeping at the time. Video recorded on cellphones by eye-witnesses showed huge flames crowning the terrace of the large, white building. A person is seen dangling from the terrace and then jumping off. Most of the deaths took place due to suffocation, the police said. Karol Bagh, in central Delhi, is popular with tourists and lined with hotels and markets. 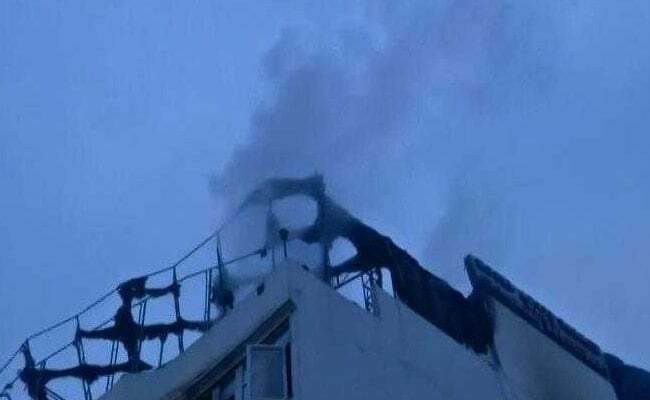 A short circuit is suspected to be the cause of the fire that broke out in Karol Bagh's Arpit Palace hotel in the early hours today, a senior civic official said. The manager of the hotel, Rajender, and an employee have been arrested. 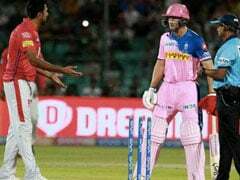 The case has been transferred to the crime branch. The Delhi Police has registered a case of culpable homicide not amounting to murder. Tragedy struck a Kerala family on Tuesday when three of its members died in the fire. The family was a native of Kochi and was visiting the city to attend a wedding. Union Tourism Minister KJ Alphons has said that the emergency exits of the hotel were closed every night. "We just took a look at the emergency exits. It's all illegal. These are very narrow, not according to specifications. And they were closed at night. According to information we have, those gates are closed at night and a guard sits outside. 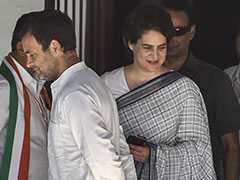 But we don't know if the guard was there or not," Mr Alphons told reporters. Tara Ram, a cook, is among the dead. He is survived by 4 children, who are between the age of 5-10 years of age. He had been working at the hotel for two years. President Ram Nath Kovind expressed grief today after 17 people were killed in Delhi's Karol Bagh fire. 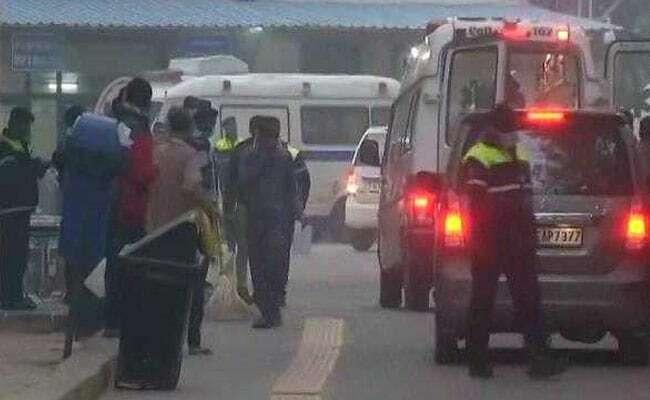 The head of forensic department of RML Hospital said that four of the 13 bodies that reached the Delhi hospital after fire broke out at a hotel in Karol Bagh were burnt beyond recognisation. "It will take time to identify them. 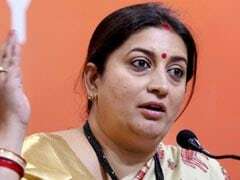 Till now 5 bodies have been identified, in which two are females and 3 are males," Yogesh Tyagi told news agency ANI. Delhi's home minister Satyendra Jain told NDTV that buildings in the national capital can only be constructed up to four floors. 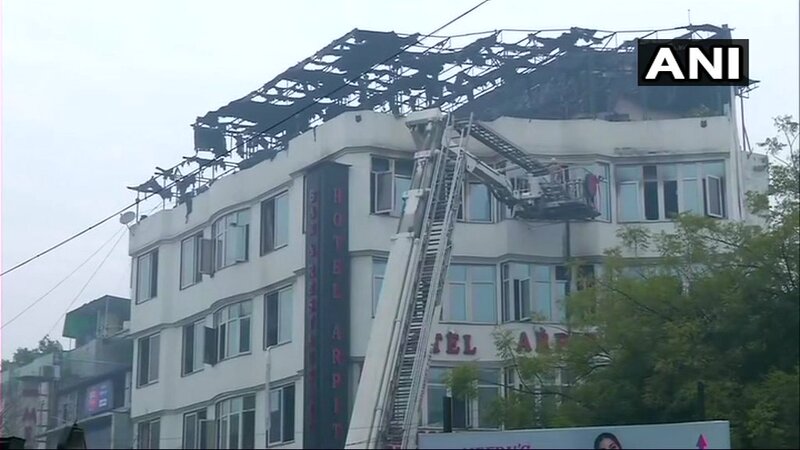 Hotel Arpit Palace that caught fire today has six floors. Most of the residents were sleeping at the time the fire broke out in the early hours of Tuesday. It is estimated some 120 people were inside the building, built around 25 years ago, according to the hotel's website. Delhi government has announced Rs 5 lakh compensation for the families of the 17 persons who were killed in the hotel fire in Karol Bagh today. 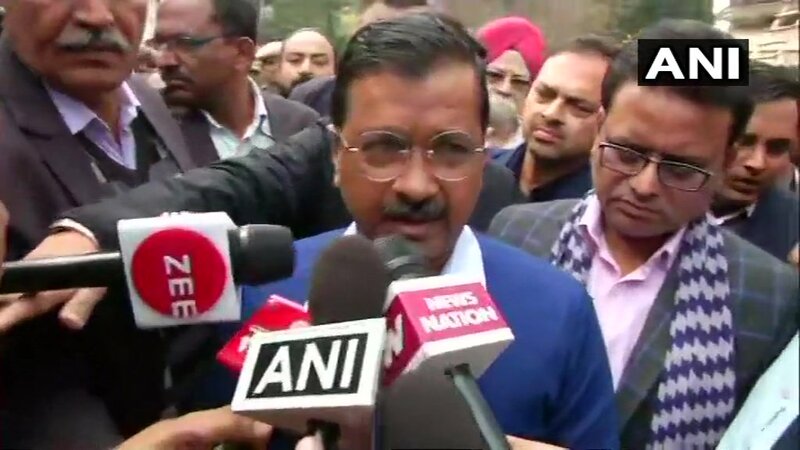 Delhi Chief Minister Arvind Kejriwal reached Karol Bagh today after a massive fire broke out in a hotel that killed 17 persons. "We don't know the cause of fire yet. An inquiry is on," he said. "The local MLA said there are more hotels like this. 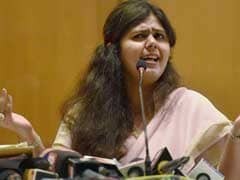 There will be an inquiry to find ones which are breaking the law," Mr Kejriwal added. The fire, which killed at least 17 people, initially broke out in the second floor of the building, an North Delhi Municipal Corporation official said. In the wake of the fire incident in Delhi's Karol Bagh that killed 17 people, Deputy Chief Minister Manish Sisodia has ordered cancellation of an event to mark the fourth anniversary celebration of the AAP government in Delhi today. Bollywood singer-composer Vishal Dadlani was to perform during the event to be held at Delhi's Talkatora Stadium. 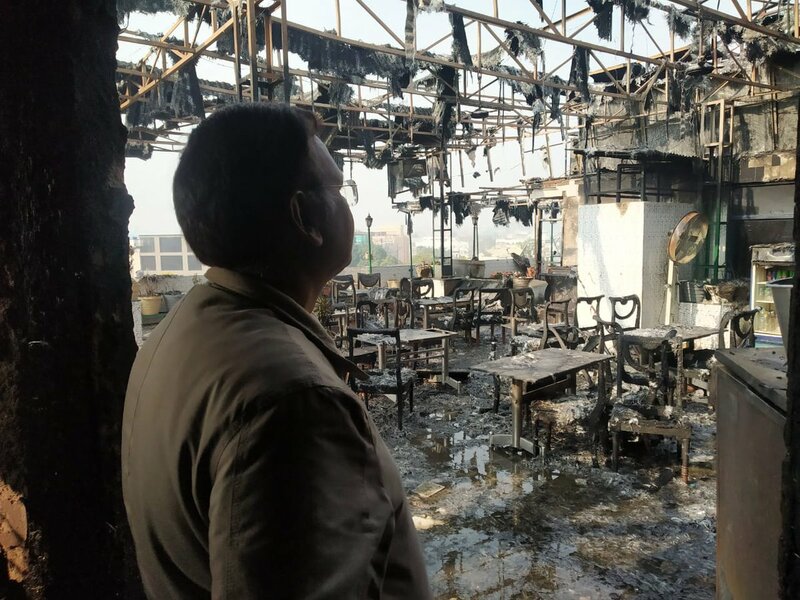 "The deputy chief minister has ordered cancellation of today's event owing to the Karol Bagh hotel fire incident," a senior government official said. Authorities appeared to have been negligent in enforcing building laws in the surrounding area, Delhi's urban development minister Satyendar Jain said. "There is a clear case of negligence here," he added. 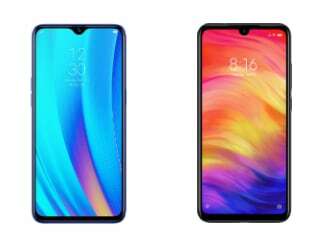 Even though the law limits construction only to four floors, the hotel had a fifth floor, like some other nearby structures, Mr Jain said, adding that a kitchen and dining area on its top floor constituted another violation. Mr Jain said hotel guests tried to flee through the hotel's narrow corridors, panelled in wood. Some were unable to break through the windows of their rooms. "We have ordered for a magisterial inquiry into the case. Apparently, there were lapses (from the hotel administration's side) and action will taken against those found guilty," he added. Fires are common in congested areas, especially in cities like Delhi and Mumbai, because of poor safety standards and lax enforcement of regulations. Activists say builders and landlords often cut corners on safety to save costs and have accused civic authorities of negligence and apathy. Fire disasters are particularly frequent in Mumbai, where millions live in cramped and dilapidated properties because of high rents. In December, eight people were killed when a fire engulfed a hospital in Mumbai. In 2017, 14 people were killed, also in Mumbai, when a huge blaze tore through a popular restaurant. The woman and the child died as they tried to escape by jumping from a window of Hotel Arpit Palace in a congested part of central Delhi's Karol Bagh that engulfed the entire top floor. "The top two floors of the hotel were constructed illegally," Delhi minister Satyendar Jain said. Prime Minister Narendra Modi today expressed grief over the fire at a hotel in Delhi's Karol Bagh that killed 17. "Deeply saddened by the loss of lives due to a fire at Karol Bagh in Delhi. I convey my condolences to the families of those who lost their lives. May the injured recover soon," the Prime Minister's Office tweeted. Delhi minister Satyendra Jain said action will be be taken against those found guilty of negligence in the fire that broke out today. "District Magistrate has ordered an inquiry," he added. Images showed thick smoke and flames billowing out of the top floor of six-storey hotel, popular with budget travellers. The blaze was extinguished in the early hours with the help of at least 25 fire engines, with the top floors being gutted. NDTV's Manish Singh Sengar said that the fourth and fifth floors of Hotel Arpit Palace in Delhi's Karol Bagh were engulfed in fire that killed at least 17 today. 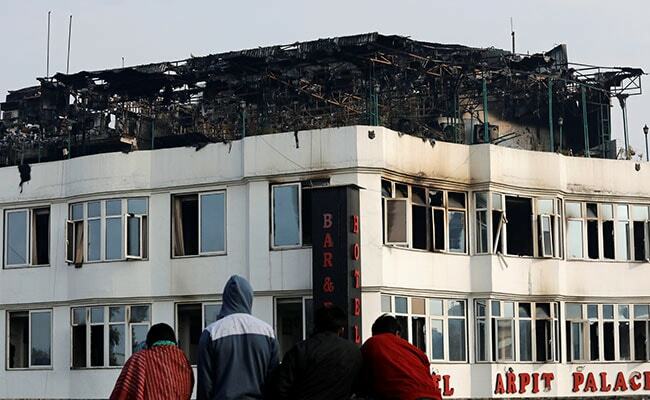 The staff of Hotel Arpit Palace said that around 150 people were inside when the fire broke out. Virendra Singh, deputy fire chief, said 35 people had been rescued from the hotel located in the shopping district of Karol Bagh. Most of the victims were sleeping when the fire broke out. Number of people who died in the fire in Hotel Arpit Palace in Delhi's Karol Bagh area today is now 17. Number of deaths now 15 in the fire that broke out in a hotel in Delhi's Karol Bagh area early today. The vice-president of Delhi Hotel Association told news agency ANI that all fire norms were maintained in Hotel Arpit Palace in Karol Bagh. "It was due to fire in ducting because of which it spread to the hotel rooms. All norms were followed here. License is issued only after inspection," Balan Mani said. "Mishappening can occur in a house as well," Mr Mani added. Thirty-five people were rescued and those injured were taken to the Ram Manohar Lohia Hospital. Most of the deaths took place due to suffocation, the police said. Two people were even seen jumping off the six-storied-Hotel Arpit Palace in a bid to save themselves from the fire. Rescue operations in Delhi's Hotel Arpit Palace have is now over. "There was wooden paneling in the corridor because of which people couldn't use corridors to evacuate," fire officer Vipin Kental said. He added that the cause of fire is yet to be investigated. At least nine people, including a child, were killed after a major fire broke out in Hotel Arpit Palace in Delhi's Karol Bagh area in the early hours today. According to the fire department, seven men, a woman and child died in the fire. 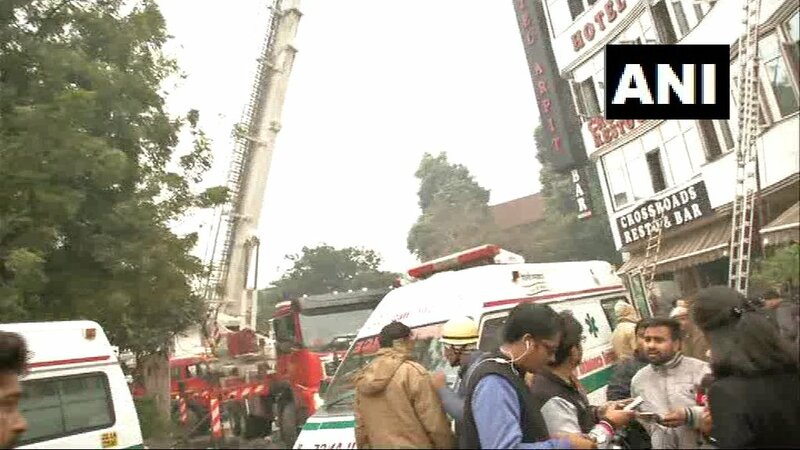 At least 20 fire engines are at the spot to douse the fire at Hotel Arpit Palace in Karol Bagh area in central Delhi, news agency ANI reported. Fire officer Sunil Choudhary said the fire at Hotel Arpit Palace fire in Delhi's Karol Bagh area has been doused. "Bodies are being taken out now," he told news agency ANI. Fire broke out at Hotel Arpit Palace in Delhi's Karol Bagh at 4 am, when people were mostly asleep. At least 25 people have been rescued till now out of the 5-storey hotel. Pictures from Delhi's Karol Bagh area where a fire that broke out in Hotel Arpit Palace has killed 9 people. Rescue operations are currently underway.